PCL LinkDump: Where Have You Gone Nelson Briles? Where Have You Gone Nelson Briles? With the World Series ready to kick off, it's a perfect time to load up on this cheesy collection of baseball tunes. Close your eyes and take in a deep breath. Smell the brats, the fresh cut grass, fresh hops from the cold draft beer you're holding. Ahhhhhhhhhhh America's pastime in all it's glory! 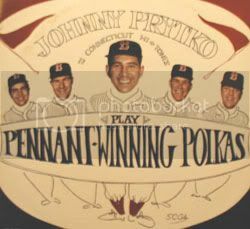 Listen to the dulcet tones of Johnny Prytko and His Connecticut Hi-Tones playing "Yaztremski Hop Polka: From the Play Pennant-Winning Polkas LP, released in celebration of the Cards winning the 1967 World Series. Maury Will and The Base Stealers classic rendition of "Crawdad Hole" anyone? Brace yourself for Phil Rizzuto, Tommy Heinrich, Ralph Branca, and Roy Campanella's - The Umpire. "Ed Nottle - Always On My Mind: Nottle has spent most of his career managing minor league and independent league teams. When he finally did receive a brief shot in the big leagues, he blew his savings recording To Baseball With Love. The album cost Nottle his house ("But big deal. Everybody’s got a house. "- Ed Nottle). Forget about Rites of Spring, this is as emo as it gets." It can all be had for your listening pleasure courtesy of Withdrawn Records in streaming or download modes. Splogman forgot to shout: 4000! Mary Tyler Moore A Go-Go ! A Cartoonist Exclusive: Read and Burn! Come and Dance and Love the Fish! My First Record - Even Stupider!